I have a friend who is planning on having a wedding reception next year. The couple will have a tight budget. Naturally, I started brainstorming ways to take things from my daily life and transform it into a "theme" for a wedding. 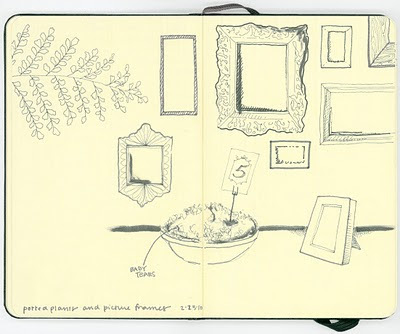 Above is a page from my sketchbook that uses two things from my house that I have a lot of - picture frames and potted plants. You can place photos of you and your special person in the frames, as well as table numbers, event menus, fun facts, and more. The potted plants step in to add some soft edges to the lines of the frames, add greenery, and life to a space. I suggest going for similar types such as a variety of ferns or succulents (helps create a cohesive feeling). Email me if you want to know more about this sketch and how you can make it economical!